One of my favorite things to do, in late summer and fall, is listening to the songs of insects. Getting close enough to watch a katydid actually singing can be quite exciting. 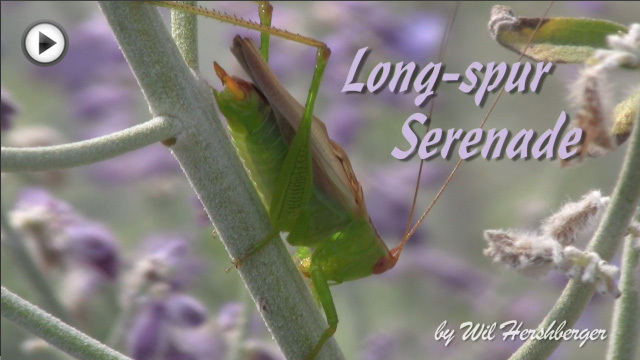 This video vignette of a Long-spurred Meadow Katydid gets right in there, up close. Being able to watch him sing is a great way to learn about stridulation. 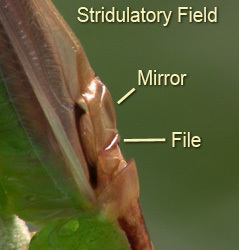 In crickets and katydids, stridulation is the rubbing of one wing against the other. Males are the only ones that sing, so it’s the males that we seek out to observe. The male in this video is “left-handed,” his left wing lies over his right one. Most crickets and katydids are left-handed. In the image to the left, we are looking at the area of the wings where the sounds are produced, the stridulatory field. The underside of the bar that runs across the stridulatory field has a row of tiny teeth and is called the file. An edge on the top of the lower wing, the scraper, runs across this file vibrating the wings. These vibrations cause the clear areas in both wings (the mirrors) to resonate, amplifying and producing the sounds that we hear. While watching the video, carefully look for these features as he sings. I was extremely fortunate to find this singing Long-spurred Meadow Katydid in a friend’s beautiful garden. He was perched beside a gurgling waterfall in a patch of gorgeous purple Russian Sage (Perovskia artriplicifolia). Long-spurred Meadow Katydid singing in isolation. Recorded in Ohio, August 2002 by Wil Hershberger. Because the Long-spurred Meadow Katydid produces broad spectrum sounds where most of the energy lies above 10,000 Hz, their songs are rather difficult for some people to hear. The pitch lowered song example below is much more audible to our ears. The recording was lowered two octaves in pitch, but nothing was done to the tempo of the song. Pitch lowered version (2 octaves). Long-spurred Meadow Katydid singing in isolation. Recorded in Ohio, August 2002 by Wil Hershberger. Long-spurred Meadow Katydids occur across the mid-western US, from eastern Ohio to western Nebraska and from southern Minnesota to the Gulf coast. Cedar thickets, wooded areas and the margins of woods and fields are their preferred habitats. They seem to prefer cedars and junipers for their homes. From these lofty perches, they sing day and night from July until the frosts of fall silence them for the season. Listening to a chorus of many singing males fiddling away on a warm summer afternoon is a wonderfully relaxing and pleasing experience. When we couple hoodia sale canada our modern eating habits with the fact.. Excellent video! I agree that it is quite amazing watching katydids sing. I have seen multiple katydids singing, in real life: Gladiator Meadow Katydid, Black-Legged Meadow Katydid, Sword-Bearing Conehead, etc. Lately, I haven’t heard any katydids.